This post and infographic comes to us via Jessica Dais at TakeLessons. Is there something you’d like to share with The Music Entrepreneur HQ community? Review our guest post guidelines and find out if you’ve got what it takes. Alright, now it’s time to get inspired. Having a successful career in the music industry doesn’t come easy. It takes a lot of hard work and determination before you can even begin to see some kind of reward. This was especially true for some of the first African American musicians. Artists such as Nina Simone had to overcome major hurdles of racial discrimination and social injustice to get their music heard by a larger audience. But these artists didn’t let the setbacks stop them from creating and performing the hits we know and love today. 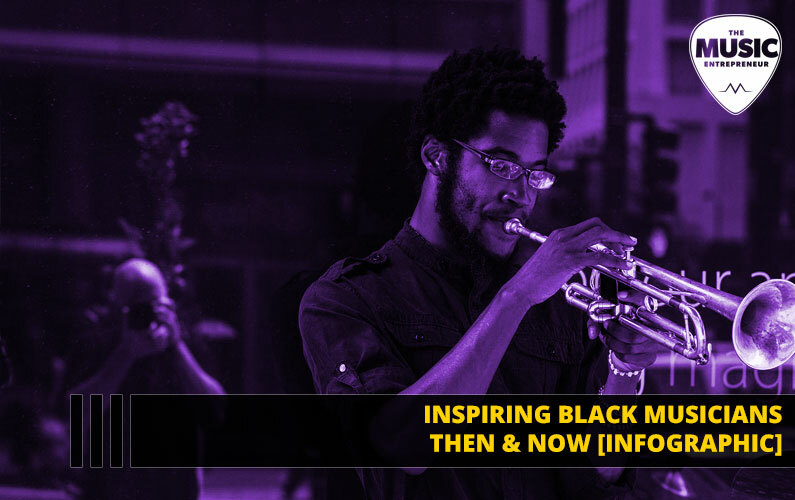 In honor of Black History Month, check out the stories of several famous black musicians below, listen to some of their most popular music, and be inspired. Jessica Dais is the chief content creator at TakeLessons. She enjoys writing meaningful content that positively impacts lives. The TakeLessons community has been connecting students with experienced music teachers since 2006.